Intrigued by this unusual string of coincidental disappearances, Scott Thybony set out to learn what happened. His investigations took him from Island in the Sky to Skeleton Mesa, from Texas to Tucson, and from the Green River to the Red. He traced the journey of Lucy Garrett from the murder of her father to her dramatic courtroom testimony. Using the pages of an old journal he followed the route of Dan Thrapp as he crossed an expanse of wildly rugged country with a pair of outlaws. Thrapp’s story of survival in an unforgiving land is a poignant counterpoint to the fate of the artist Everett Ruess, which the New York Times has called “one of the most enduring mysteries of the modern West.” Thybony draws on extensive research and a lifetime of exploration to create a riveting story of these three lives. Scott Thybony’s explorations of the American West have resulted in award-winning articles in magazines such as National Geographic, Smithsonian, and Outside. His books include Burntwater, chosen as a PEN Center West finalist for creative nonfiction, and the bestseller Canyon Country, from the National Geographic Society. "For a long time, many of us have known a simple truth: No one writes better about the American West than Scott Thybony. He proves that fact again with The Disappearances. It is a compelling book from the first sentence to the last has he interweaves startling stories with poetic descriptions of time and place. 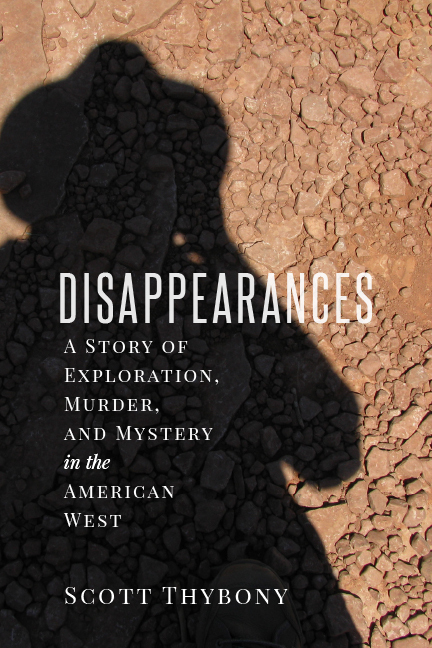 With The Disappearances, Thybony shows why he has to be ranked alongside Ed Abbey and Chuck Bowden as a brilliant interpreter of the West."